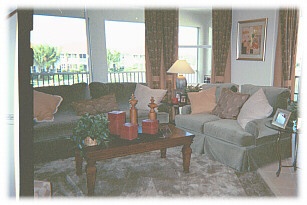 Adult community, condo new beautifully decorated, great place for seniors with many activities. Photos can be sent when requested on line by contacting us by E-mail. In the Burnt Store Marina and Country Club, on Port Charlotte Harbor. 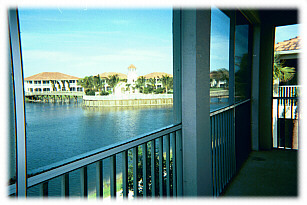 Condo overlooks a lake next to the marina. Direct access to the Gulf of Mexico. 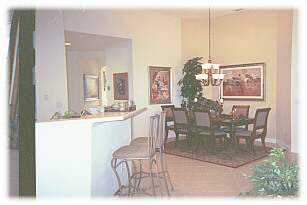 Kitchen has bar area with bar stools, walk in pantry, corrion counter tops, all marble floors, and cherrywood cabnets. 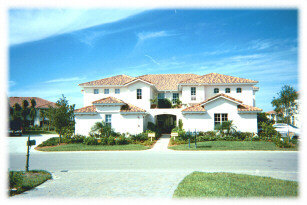 2300 sq feet living space, 2800 with screened lanai, 2 car garage, laundry room and entry hall, video room with large screen TV, VCR, CD player, den has all built-in cherrywood bookcases and cabinets and walk in wine cellar. Upgraded carpet in bedrooms, den and video room. House professionally decorated with upscale furniture, pictures and accessories. Other amenities not listed above: Gated complex within a manned security gated community, 27 holes of gulf, 6 tennis courts, waterfront restaurant and lounge with live entertainment, 450 slip marina, fishing, boating, condo never lived in brand new is now the model for complex. Photos can be sent when requested on line by contacting us by E-mail. 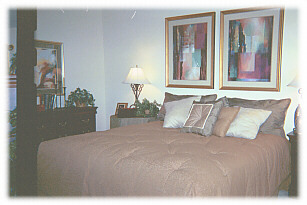 Condo turn key for season renters, no smoking, no pets, no children under 18 except for visiting. $3200 per month during season January through May. $2300 off season. Year round starting January 5th 2002.